ICED TEA GRANITA PERFUMED CANDLE - A fresh fragrance, an infusion of green tean and mint mixed with lemon wests. 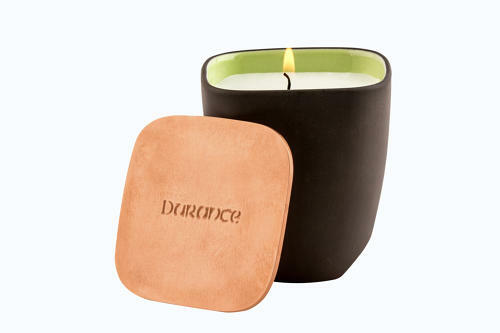 The cedar and the white sandalwood brings elegance and warmth to the fragrance. A truly original creation, this Durance Empreinte collection is a unique interior signature, in collaboration with Revol, creators of black ceramics since 1769. 100% made in Provence. Original blended fragrance in natural wax enriched with beeswax by Durance in a black ceramic and enamelled pot by Revol with a solid copper lid.